A Permanent Home That Allows Drinking Helps Homeless Drink Less : Shots - Health News Homeless people may stand a better chance of improving their health when offered a permanent place to live without a requirement for sobriety, the results from a Seattle center suggest. Brian Steik sits in his cubicle at a apartment building for homeless alcoholics in Seattle. Most housing set up to help the homeless comes with a strict no-booze policy. But a study on a controversial complex in Seattle that allows chronic alcoholics to keep drinking suggests the lenient approach can work too. Homeless people with alcohol problems decreased their consumption over two years at the facility, called 1811 Eastlake. The average amount of alcohol consumed on a typical drinking day by the 95 study participants had decreased by about 25 percent at the end of the two-year study. So what gives? Clinical psychologist Susan Collins, lead author of the study, attributes the decrease in drinking to rules that are easier to stick with and ample support for the residents. The findings were published online by the American Journal of Public Health. Typical housing can overwhelm residents with curfews, treatments and sobriety — all at once. Collins says that can set a person up to fail and return to the streets. 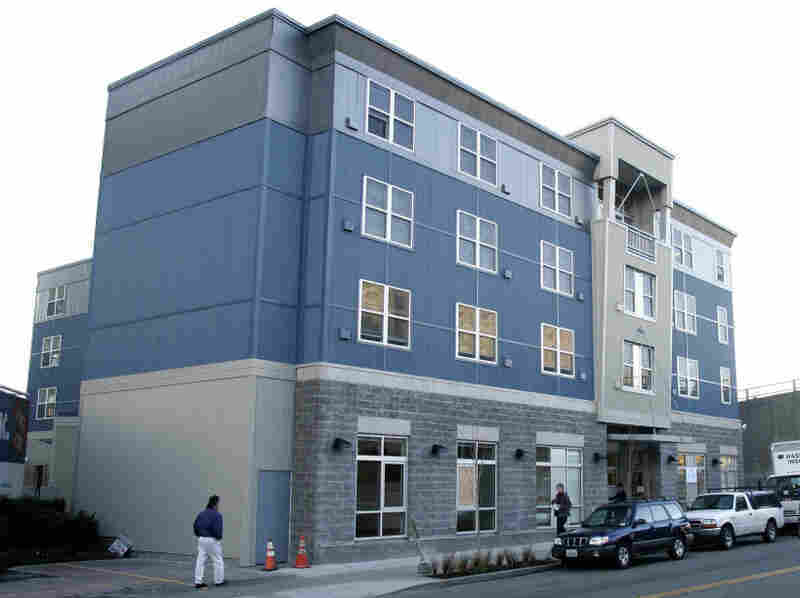 The experimental complex in Seattle bucks the traditional ideas that homeless people need "dry" housing and that they need treatment of all their health issues immediately. Collins says the data show that finding homeless people a permanent home first may provide them with the support they need to tackle other health concerns later. It provides them with a more normal existence, she says. "Individuals' internal motivation to change was more predictive of decreases in drinking and alcohol-related problems than was attendance at traditional abstinence-based treatment," she tells Shots. Participants, who were deemed chronically homeless by researchers, were not required to attend alcohol-abuse meetings throughout the study. They did, however, agree to spend 30 percent of their income — if they had any — on rent and social services. The housing project was set up by the Downtown Emergency Service Center in 2005 to help lower the costs of caring for the chronically homeless. The center also partially funded the study. "What we want to do is help them discover ways to reduce the levels of consumption, around a bunch of people that actually care about them, and reduce their utilization of these other expensive services," Bill Hobson, executive director for the center, told NPR in 2006. Researchers surveyed participants about their drinking habits during their stay. Collins says the researchers took extra measures to ensure answers were honest and unaffected by bias. "Drinking was not stigmatized in the house," she says. "Participants knew they would not get kicked out if they said they were drinking, so they were more encouraged to be up front about their drinking." "The participants in our study are human beings who are capable of positive behavior change," she says. "They're able to do that when given a home." A 2009 study in JAMA, the Journal of the American Medical Association, suggested this type of housing saved Seattle taxpayers more than $4 million in costs from publicly funded services.